Do you have three men’s coats in your closet? Or do you have friends that might? It can be easy to accumulate cold weather clothing in the backs of closets or under beds, but we can put those coats to great use! 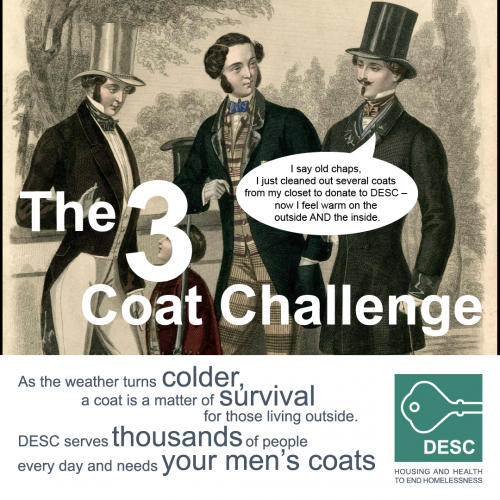 We challenge you to find three gently-used men’s coats, either in your own home or by asking your friends. Three coats can save three lives when the weather gets dangerously cold. 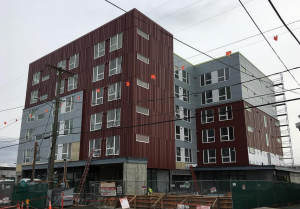 Drop them off at our main administrative offices at 515 Third Avenue Seattle, WA 98104, or arrange a drop off at our donation warehouse in the Rainier Valley. Questions? Contact our donations team at donations@desc.org.